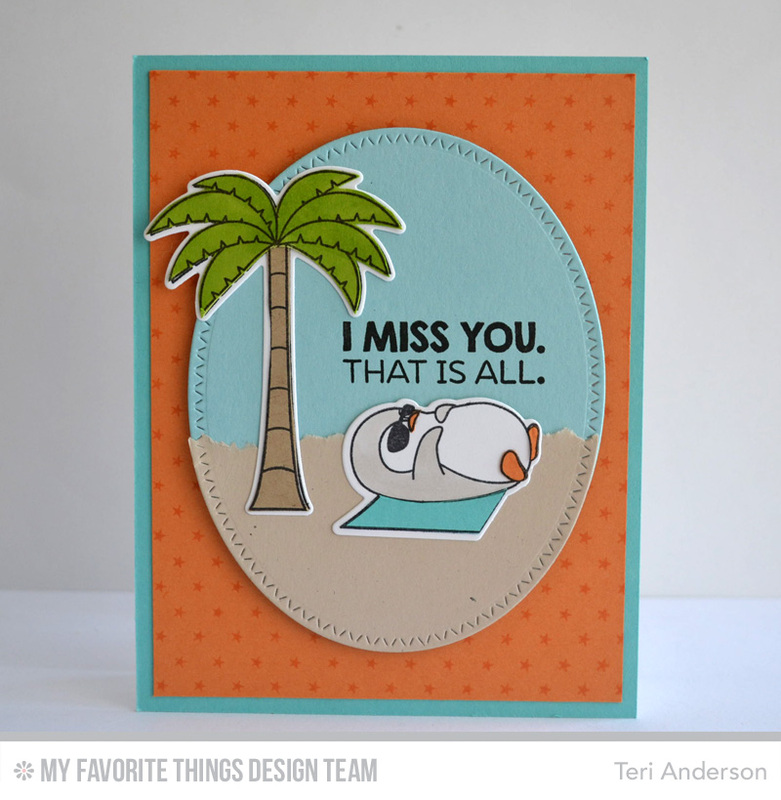 MFT Countdown: 4 | A bit of this. A bit of that. It’s another day of counting down to the June release from My Favorite Things. Save your pennies, guys. So. Much. Good. Stuff. And you know me! I’m here with a couple projects made with the new stuff. Let’s do this. So please meet card #1. This was sure fun to make. 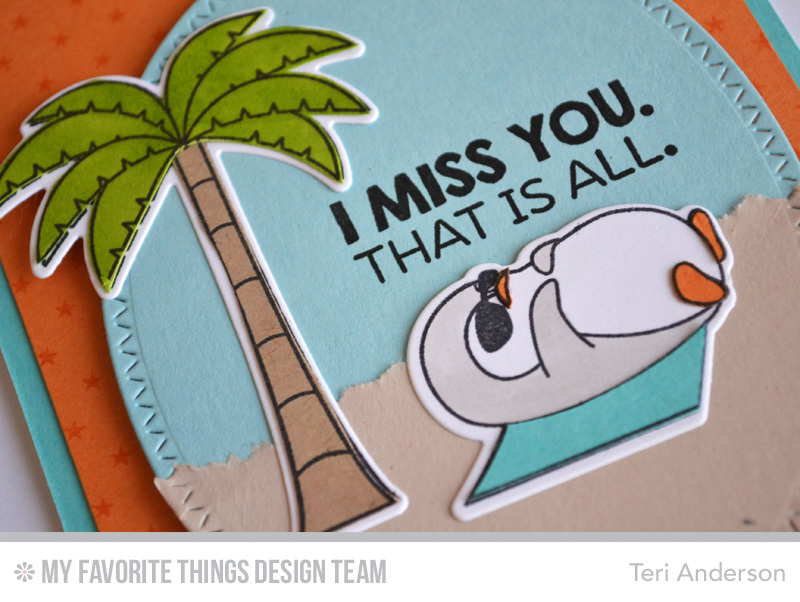 I love a good penguin stamp set and the new Penguins in Paradise is one of the cutest I’ve seen. Penguins + a beachy flair = something you can’t go wrong with it. I played it short and sweet here, crafting a simple little scene with the stamp set and coordinating Die-namics. The oval was cut with the new Zig Zag Oval Stax Die-namics. I cut two ovals (one from kraft cardstock and one from a blue). Then I torn the kraft one to try to mimic the look of sand. I went (totally) wild here! I used some of the same products to make this one, plus I used the Zig Zag Square STAX and Zig Zag Circle STAX Die-namics. The penguin (or is that Mrs. Penguin?) started out pretty simple and cute. And then I went crazy embellishing her, adding polka dots to her tube, forming glasses from wire and adding a bow to her head. It’s a little over the top, but she sure makes me giggle! Be sure to check out the MFT Blog to see who else from the design team is sharing projects today. You’ll find a list below of the MFT products I used on my cards today. By the way, the new stuff lands on June 2nd at MFT! So adorable.. Love that you made your little penguin female.. Thank you for sharing. Was just coming by on the PS Blog Hop and saw this penguin with the wire glasses…..how hilarious and clever!! What a brilliant idea, you really brought her to life! Oh Teri you’ve taken a darling new BB by Torico and tweaked her in such a darling way… love those wire-rims! the second card made me laugh! so pretty! 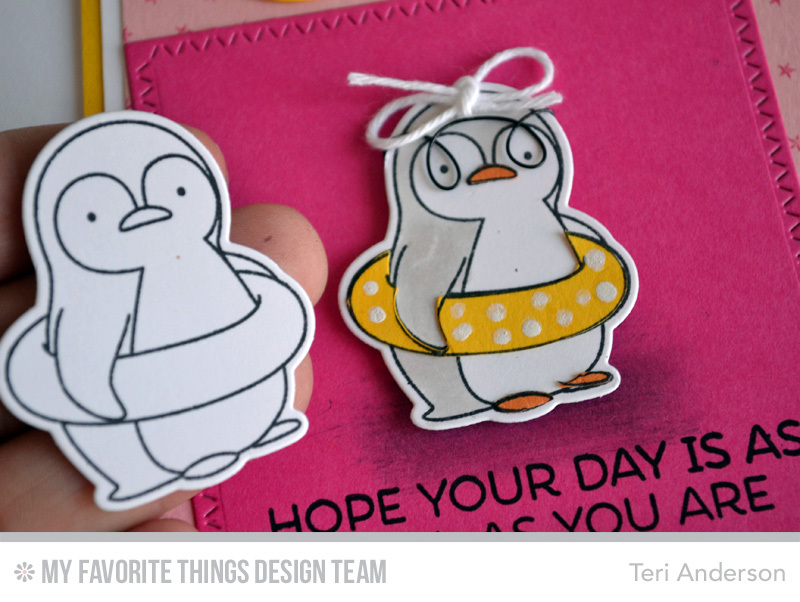 Love the pink penquin card! Sweet! These cards certainly made me smile. They are just so stinkin’ CUTE! Your pouty penguins are just perfect! How cute is Mrs Penguin. Love the glasses, bow and dots. omgosh, too cute!!! love the wired frame glasses!